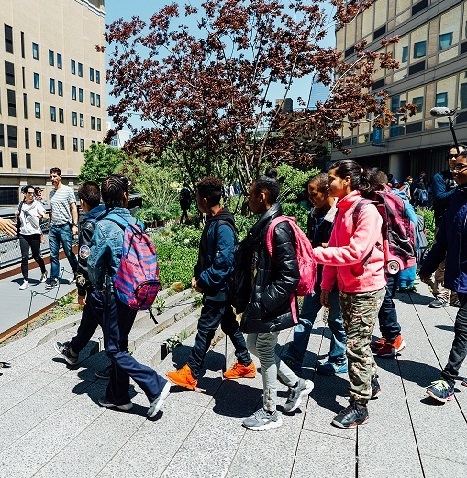 To aid the 6,000+ students who visit the High Line on self-guided experiences each year, Friends of the High Line offers free educational resources for teachers. Climate and conditions shape the development of landscapes, and the choices of landscape architects. Ecosystems are a combination of climate, conditions, and biodiversity. To identify an ecosystem, you must look both at the adaptations of plants individually, and the climate and conditions of the system. You will receive the self-guide in your confirmation email. If you have any questions, please contact us at grouptrips@thehighline.org. Please note that due to park regulations, all visiting groups must be kept to a small size. We suggest splitting each class in half with at least two chaperones.